General Electric (GE) Shares Sold by Mathes Company Inc.
Jeff Sessions the United States Attorney General suggested in the last few weeks he may resign amidst growing tension with President Donald Trump, said one person close to the ongoing situation. 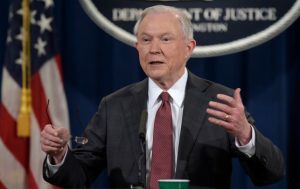 Sessions came under fire from Trump due to his recusal from the Russia meddling investigation related to last year’s U.S. election, which is an inquiry now exploring if associates of Trump colluded with the Moscow government. The suggestion by the AG that he may consider stepping down was confirmed by one person discussing the situation on the condition of remaining anonymous. Trump has also assailed the Department of Justice for how it handled the White House’s travel ban, and accused the DOJ in a number of tweets Monday of weakening the plans he has to limit entry for citizens of several Muslim nations. Both of the two travel bans imposed by Trump were blocked in federal courts. Trump in one of his tweets from Monday said the DOJ should have remained with his original travel ban and not the one that was watered down and politically correct that they submitted. However, both of the bans were signed by the president. Sean Spicer the spokesman at the White House declined on Tuesday to say if Trump continues to have confidence in his AG following the tweets made by Trump on his travel ban. Spicer would only say he has not discussed that at all with the president. Spicer back on May 9 gave an answer that was quite similar when he was asked what Trump’s confidence level was for James Comey who at that time was the FBI Director. Later the same day Comey was fired by Trump. On Thursday, Comey will testify before the Senate’s Intelligence Committee regarding his interactions with the president. The ousted director of the FBI is expected to talk about if the president had asked him to slow down the probe of Russia and an inquiry into Michael Flynn the former National Security Adviser. Sessions, who is 70, holds a unique role on the White House. He was the first U.S. senator that endorsed Trump as a presidential candidate and who defended Trump without reservations through his darkest moments of his campaign. After the unexpected victory by Trump, the senator from Alabama was given a cabinet position of his choice. Yet not even a month after becoming the attorney general, Sessions was at the center of heavy controversy after not disclosing at his confirmation hearing two talks he had with a Russian ambassador. Rhumbline Advisers Boosts Position in CECO Environmental Corp.